The Sólheimajökull glacier as seen from the start of our hike. A few weeks ago, my wife and I traveled to Iceland on vacation where we hiked inside a volcano, soaked in hot springs, climbed behind waterfalls, and walked along a black sand beach. Each of these experiences were unlike anything either of us had experienced before. While on these adventures, we also learned some surprising facts about the country: Iceland generates almost all of its energy from renewable sources, and the impacts of climate change are increasingly visible. Our guides told us the only cheap thing in Iceland is electricity. Almost all (99.5 percent) of Iceland’s electricity is generated by geothermal (24.5 percent) and hydroelectric power plants (75 percent). This is possible because Iceland’s population is small (323,000 people), they have abundant geothermal pools, and large amounts of precipitation that is stored in glaciers, ice caps, and other sources that can be used to generate hydroelectric power. One other factor that contributes to the all-renewable electricity generation in Iceland is that all the hot water used by households and building heat is harvested directly from hot springs and transported to the cities. In the United States, hot water and home heating use about 60 percent of total household energy consumed. What’s even more surprising about generating almost all of their electricity from renewable sources is that Iceland manufactures around 2 percent of the world’s total aluminum. The inexpensive, all renewable electricity in Iceland makes it a good candidate for the energy intensive aluminum manufacturing process. Even though about 70 percent of Iceland’s total electricity consumption comes from their aluminum plants, there is still a great amount of untapped hydroelectric resources. 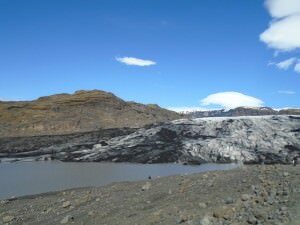 One of the most striking experiences we had was hiking the Sólheimajökull glacier near the famous volcano Eyjafjallajökull. Glaciers are constantly melting and changing, and our guide commented that the glacier was significantly different on our hike than it was just a few days earlier. This is common and expected with glaciers, but he added that the glacier’s height is about half what it was four years ago. Recent studies in Iceland have discovered that about 11 billion tons of ice are being lost from Iceland’s glaciers every year. As a result of this melting, the pressure on the rock is reduced, which is causing the land to rise by about 1.4 inches per year. It could rise to as much as 1.6 inches per year by 2025. The rising rocks could also cause increased volcanic activity on the island. As the glaciers continue to melt, Iceland’s ability to generate hydroelectric power may decrease and could require new investments in infrastructure. We went to Iceland to explore the natural wonders, and the trip was well worth it to have these once-in-a-lifetime experiences. We also witnessed real examples of the impacts of climate change. I returned from the trip with a renewed hope that smart management of resources to generate renewable electricity is possible in the US, and it is possible to generate the majority of electricity using only renewable energy sources.